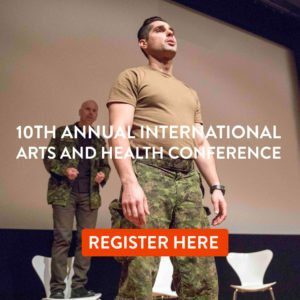 Health and the Arts – presentations will inform healthcare administrators and health professionals about best practice arts and health programming and environmental design in primary and acute care, community health and health promotion. Creative Ageing – presentations will demonstrate the utilisation of arts and health programs in retirement villages, services for older people in the community and residents in aged care facilities, including programs for people living with dementia and Parkinson’s. Arts and Health Programs in Museums and Galleries and Performing Arts Centres – presentations will illustrate the expanding opportunity for Access and Public Programs in museums, galleries and performing arts centres, in visual, digital, literary and performing arts. 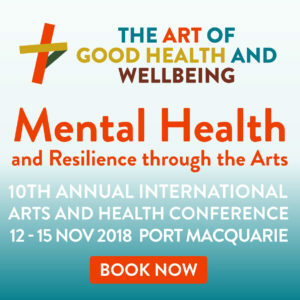 Professional Training for Health Professionals and Artists to gain greater appreciation of the ways in which arts and health lead to health and wellbeing outcomes and the value of medical humanities for professional development and lifestyle balance. Arts and Health Evaluation and Research – presentations will describe how to measure the benefits and outcomes of arts and health programs and scope international research networks and collaborations. New Boundaries: Cultural Tourism – explore the opportunities for the arts in promoting health and wellbeing through nature and the environment. Conference program details, including keynote speakers, will be progressively released on this website and via our newsletter. For more details, contact info@artsandhealth.org.au or subscribe to the Arts and Health newsletter on the website.